From your description and known dry conditions in your region I suspect the tree is suffering from lack of water. 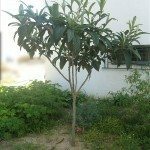 Though a Loquat tree can be somewhat drought tolerant, it the soil dries out and the roots dry up, eventually the tree may die. Try increasing the irrigation to the the tree. Adding some organic mulch to the soil around the tree and mulch with 2 to 3 inches of hardwood mulch to help with moisture retention. So I guess I should have given more detail. The loquat in question has plenty of mulch around it--we replace regular especially because of the drought here. Also, We're still allowed 2 days a week for drips but only 1 day a week for lawn/sprinklers. The drips are cut back slightly for winter but I put them back up a couple of week ago. The loquat has it's own drip and it is maybe only a foot from the lawn so it gets water that way too. Also, the builder planted it really close to the corner of our garage--too close in my opinion. If it dies, I doubt I'll replace it. I gues we should just trim off the dead branches? or is it just the foliage that's dead? Should we leave the branches and see what happens? I should probably get an arborist to come look at it. I'll try to repost the question with pictures from my desktop...maybe that will work.